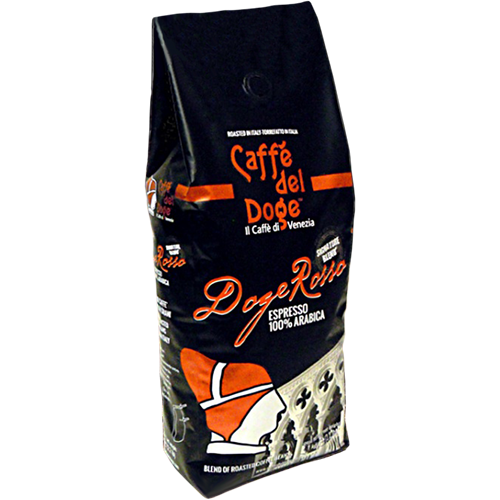 Caffè del Doge Rosso is made from 100% washed highland Arabica from Brazil, Colombia, Guatemala and India. A perfect arabicablend for lovers of sweetness and acidity with distinct fruity notes. Each type of coffee is roasted separately and the entire blend is mixed together only when the beans has cooled down so that every coffeebeans unique qualities are emphasized. Caffè del Doges roastmasters knowledge comes from many years of coffee roasting. The idea was for him to work only with washed Arabica and Robusta of the highest quality. Each beans origin can be traced back to the particular plantation or cooperative where it was grown. Each type of bean in the blend is named after that particular farm or producer who cultivated them. The traditional antique Venetian flavor is characterized by simplicity, aromas and a balanced acidity.